This is a single user license, allowing one specific user access to the product. The product is a PDF. This is an enterprise license, allowing all employees within your organization access to the product. The product is a PDF. Adhesive is a non-metallic material which is able to join two substrates using adhesion mechanism which is developed between the adhesive and substrate and cohesive mechanism which is developed within the adhesive itself. Sealant is a substance used to block the passage of fluids through the surface or joints or openings in materials. The main difference between adhesives and sealants is that sealants typically have lower strength and higher elongation than do adhesives. 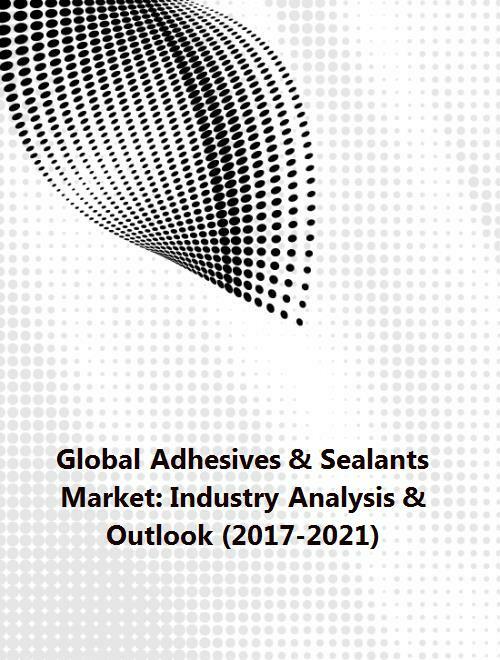 The adhesives and sealants market is quite fragmented. The competition in this industry is high and mainly on the basis of quality, reliability, technology, novelty, durability and broad spectrum usage of adhesives and sealants. Product innovation and product performance play a major role in the defining the competition in the global adhesives and sealants industry. The key factors driving the growth of global adhesives and sealants market are accelerating economic growth, growth in urbanization, increase in global construction spending, growing automobile production and growing demand for thermal and noise insulation. Some of the noteworthy trends and developments of this industry are new developments in adhesives, trend of eco-friendly adhesives, adhesive end market performance trends and strong opportunity in emerging economies. However, the expansion of global adhesives and sealants market is hindered by negative effect of fluctuating raw material prices and strict regulation on volatile organic chemical. The report "Global Adhesives & Sealants Market: Industry Analysis and Outlook (2017-2021)" provides an in-depth analysis of the market on a global scale. The major trends, growth drivers as well as issues being faced by the industry are being presented in this report. The industry comprises few large players such as Henkel, 3M, H.B. Fuller and ITW. All these companies have been profiled in the present report highlighting their key financials and business strategies for growth. Adhesive is a substance that is capable of holding materials together in a functional manner by surface attachment that resists separation. It is a non-metallic material which is able to join two substrates using adhesion mechanism which is developed between the adhesive and substrate and cohesive mechanism which is developed within the adhesive itself. Sealant is a substance used to block the passage of fluids through the surface or joints or openings in materials. Adhesives and sealants are categorized on the basis of whether the bonding involves a physical or chemical mechanism. Adhesives and sealants market is rapidly developing due to their use in numerous end markets like automotive, transportation, construction, military grade, casting, engines, roofs and others. The competition in the adhesive and sealant industry is fragmented. The demand for this market is rising and to meet the demand, the companies are increasing their production capabilities and in addition to it, are looking for making of new innovative products which suits the environment as well. As per the report "Global Adhesives & Sealants Market: Industry Analysis & Outlook (2017-2021)", the demand for adhesives and sealants market will be driven by accelerating economic growth, growth in urbanization, increase in global construction spending, growing automobile production and rising demand for thermal and noise insulation. Some of the noteworthy trends and developments of this industry are new developments in adhesives, trend of eco-friendly adhesives, adhesive end market performance trends and strong opportunity in emerging economies. However, the expansion of global adhesives and sealants market is hindered by negative effect of fluctuating raw material prices and strict regulation on volatile organic chemical. The report presents an in-depth analysis of the global market. The major trends, growth drivers as well as issues being faced by the industry are being presented in this report. A thorough analysis has been conducted on key market players covering their business overview, product portfolio, financial overview and business strategies.